You will never have to worry about a damp, moldy basement again. Our patented wall, ceiling and floor systems are moisture & mold resistant and extremely durable. TBF basement finishing systems can very easily be customized to provide an attractive look for your basement. The system can be outfitted with faux-wooden trim in your choice of available colors, includes crown molding, and you can hang items - even a flat-screen television - anywhere on your wall without the need to locate a stud! There are none! Your vision for an eye-pleasing, functional room that compliments any decor will become a reality in about 2 weeks time with Kuhn Construction! Call or e-mail us today for a free basement finishing quote! 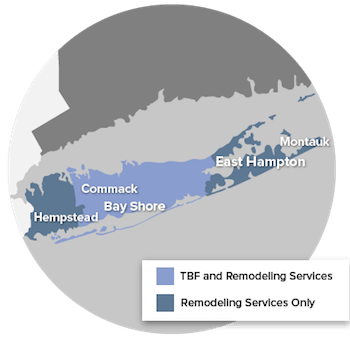 We serve the New York areas, including Riverhead, Babylon, Huntington Station, Bay Shore, Brentwood, West Babylon, Farmingville and nearby. ThermalDry® Insulated Floor Decking™ combines rigid foam insulation with composite underlayment in a unique subfloor system that can't be damaged by mold or moisture. ThermalDry® Elite Plank Flooring provides a luxurious wood plank look, design, and feel - available in both light and dark colors - using materials that are 100% basement-friendly. Our basement paneling uses advanced SilverGlo™ insulation that is 24% more energy efficient than comparable foam products. Our closed-cell insulation installs without creating "cold spots" on walls.